RFID (Radio Frequency Identification) technology is a welcome revolution in the world of logistics. RFID technology is enabling many transportation and logistics companies to achieve near perfect shipping, receiving, and order accuracy rates – along with greater inventory accuracy, nearly 30% faster order processing speeds and a 30% reduction in labor costs. Tracking systems like location-based services are expected to grow to $77.84 billion by 2021. More than 60% of manufacturers will use RFID and Real Time Location Systems (RTLS) in the next five years. RFID (Radio Frequency Identification) comprises two components. First, every RFID product has a tag (also called label), which contains an antenna and microchip. The antenna receives or transmits signal and the micro-chip stores information. The second component is the reader, also called an interrogator or read-write device. The reader reads the information on the RFID chip and transmits this information to the computer. All the information relating to the tags is stored in the warehouse’s computer. Every product is fitted with a RFID tag. A reader device is usually installed at the entry-exit point of the warehouse. The reader registers the RFID and keeps updating the data stored in the warehouse’s computer system. The information gathered helps in tracking the products accurately. Additionally, it helps in planning product locations strategically. 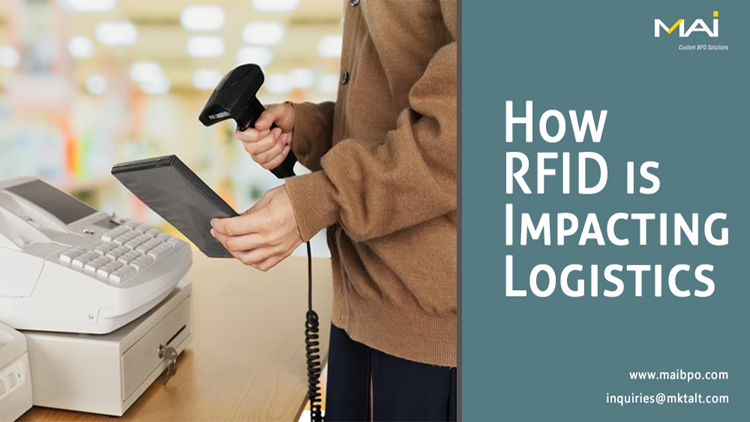 The RFID system works similarly on the other side of the logistics cycle. It accelerates the delivery management system. It helps to accurately select the product for onward distribution process. The reader installed at the entry-exit points registers the items that have moved out of the warehouse, and this information is updated in real-time to the warehouse’s computer. Advanced multi-functional RFID tags have additional sensors for performing extra tasks such as measuring temperature in case of specific medicines/chemicals that have to be stored accordingly. Collectively, these factors contribute to reducing operating costs and improving customer satisfaction. Tracking large number of cartons is a very complex process. Traditionally this was a manual process involving labor, where the probability for error is much greater. RFID has eased the situation in a big way. The technology is progressing each day that active RFIDs do not even require the product to be in the line of sight. The readers can read and keep information up-to-date. This increased visibility of goods enhances efficiency of the complete supply chain process. Thus, businesses have all-out control over the movement of goods. RFID has brought in the most sought ‘end-to-end product visibility’ into the world of logistics and supply chain management. This real-time updated information helps to maximize efficiency, reduce operational costs as well as improve customer satisfaction. As the vendors receive more cost-to-volume benefits, the penetration of such technologies will increase. As RTLS, sensor networks, and Internet of Things (IoT) are the new words in tracking, RFID devices are expected to play an increasingly important role in capitalizing on these technologies.